Stadium Financing The University will pay 52% and the State of Minnesota the remaining 48&. Naming Rights TCF Financial Corporation of Wayzata, Minnesota is contributing $35 million over twenty-five years. The University of Minnesota is willing to give up nearly 3,000 acres of land to the state if the state will pay a greater share of the cost of a new 50,000-seat football stadium. The 25-year plan would obligate the state to pay $9.4 million annually toward the stadium's debt. At the end of the term, the land near the Vermillion River could be used as a nature preserve. "It will result in some of the most beautiful, undeveloped land in the region being protected for generations to come, and it will provide the financing we need to bring Gopher football back to campus," said President Robert Bruininks. The university owns some 7,700 acres in the area. The plan is supported by local legislators and Gov. Tim Pawlenty. The plan, and a second proposal, got approval from the Senate Higher Education Budget Division this week. The school has been studying what to do with the land which has been growing in value as development expands. It is valued in some areas at $35,000 an acre. The university has valued it at $42 million. The current stadium plan calls for the school to raise 60% of the $249 million needed for the venue. The school has struggled to come up with its share. If the state signs on to the plan, the cost will be divided nearly equally. It would also allow the school to reduce the $100 student fee it planned to use to help fund its share. The second proposal would require that no student fees be increased to fund the stadium and that the school walk away from a naming rights deal already reached with TCF Financial Corp. The university hopes to open the stadium in 2009. Next year the Gophers are moving back on campus, and moving back outside. Just like old times. From his corner office on the second floor of the Gophers football complex, Tim Brewster can see TCF Bank Stadium rise steadily from the ground. Hardly a day passes that the Gophers second-year coach doesn't peer out his window to see the progress on his team's future home. Sophomore quarterback Adam Weber often finds himself doing the same thing. Any time he drives by the structure, Weber can't help but take a slow lap around it, just to see if there are any new changes. "The stadium is going to be so cool," Weber said. "It's on campus. It's our place." Almost their place. The Gophers officially will get the keys to their new digs Sept. 12, 2009, when TCF Bank Stadium holds its inaugural game against the Air Force Academy and football returns to campus. The start of every college football season is filled with excitement and optimism, but for the Gophers and their fans, the 2008 season has extra significance. This one marks the team's final season in the Metrodome, the Gophers home since 1982. A little more than a year from now, the Gophers will move into their new $288.5 million stadium, their own home, no longer co-tenants under a Teflon sky. Stadium proponents argue that an outdoor, on-campus stadium will greatly improve the gameday atmosphere, generate new revenue streams, become the focal point of campus for alumni and fans and help attract better recruits. It won't guarantee victories or sold-out attendance once the shine wears off, but Gophers officials believe it is a large chip in the ever-expanding arm's race of college athletics. As construction inches closer to completion, those closest to the stadium efforts become hyperbolic over the possibilities. "We are getting a heart transplant," said former player George Adzick, who now serves as the M Club director. The political potholes and financial roadblocks are in the past, although the school still must raise $9 million of the original goal of $86 million in private donations. But construction is on schedule and the heavy lifting is mostly done, enabling the Gophers to gaze into the future. The move a few miles down the road thus begs the question: What will the new stadium mean to the school and to a program that has six national championships on its résumé but has not played in a New Year's Day bowl game since the 1961 season and is coming off a 1-11 campaign? To hear those tethered to the stadium, it will mean everything. "A lot of Minnesotans remember those great times and want those great times to return badly," Brewster said. "I think this stadium is going to allow Minnesotans to rally around football being back on campus and allow us to reconnect with that great tradition and history of Gophers football." The mere mention of Memorial Stadium -- the birthplace of so many of those fond memories -- turns Gophers backers into mush. They remember the good times and the great players, about how they felt watching the band march down University Avenue on Saturday mornings, stories that Brewster said he's heard "a million times" in the past year. "People with tears in their eyes tell you this," he said. Count former player Judge Dickson among them. Dickson arrived on campus in 1958, shared a room in Territorial Hall with pioneering black quarterback Sandy Stephens and admits he still gets emotional when he reflects on the bus rides from the team hotel to Memorial Stadium on Saturday mornings. "It was the thrill of our season," he said. "The flags would be flying. The fraternities would be out, people cheering. Saturday was a special day." The gameday "experience" that is unique to college football has largely been dormant at the Metrodome. The atmosphere is tame, if not altogether stale. Out-of-town alumni returning for games often never step foot on campus. Weather never affects the outcome of a game, nor can it be enjoyed on a perfect fall Saturday. Gameday is simply not a spectacle, like it is at other places. "I think something is missing, and I think it's missing more today than it was when they moved to the Dome," Gophers athletic director Joel Maturi said. "All the things that now surround college football have made it far more of an event than a game. We have not had the event. We've still had the game, but we have not had the event." The move is about more than tailgating and making warm, fuzzy memories. College football is big business, and school officials expect TCF Bank Stadium to generate about $3.3 million more in annual revenue than the Metrodome. The Gophers ranked ninth in the Big Ten in football revenue in 2006 (the most recent data available) at $17.3 million. Ohio State was No. 1 at more than $59 million, followed by Michigan at nearly $51 million. The Gophers were well behind border rivals Iowa ($45.3 million) and Wisconsin ($34 million). "We were a whole lot closer to the bottom than we were to the top," Maturi said. Maturi said he's hopeful the new stadium, if sold to capacity, will help the Gophers move to the middle of the Big Ten in football revenue, which is perhaps the most realistic goal given the stadium's capacity (50,300). School officials say the new stadium could generate $8.1 million each season through premium seating (suites and luxury boxes) and preferred seating. The Gophers made only $307,000 in those two areas last season in the Dome. The school also expects to generate additional revenue from advertising and sponsorships, merchandise sales and stadium rental. Gameday parking revenue will go to the school's Parking Services and be used to pay down debt. Concessions revenue is not expected to change. Naturally, operating costs will increase considerably because the university will be responsible for the stadium for 365 days each year, rather than just seven dates. School officials estimate it will take roughly $1.66 million for year-round operating costs, which include repairs and maintenance and salaries. That figure does not include gameday operations or debt service. Even so, the annual operating income from the new stadium is projected to be $12.69 million. "[The additional revenue] means I think that we're going to keep viable -- at least in the immediate future -- a 25-sport athletic program," Maturi said. University President Robert Bruininks, who spearheaded stadium efforts, almost always talks about the stadium within the context of the school's overall academic mission. The two are intertwined, he said, noting the school has raised about $45 million in donations that will be earmarked for academics as a direct result of fundraising for the stadium. "It's a critical link between the stadium and the academic interests," Bruininks said. David Crum, an associate athletic director who oversees fundraising, also sees a critical link between giving and football's return to campus. "A lot of the giving is an emotional tie," he said. "It's a heartstring appeal sometimes. People come back and it's about the memories and the great times they had at the U." Nobody, however, is naive enough to think that nostalgia, an on-campus address and some fancy bells and whistles will automatically guarantee better on-field results. If the Gophers don't win, the novelty of a new stadium will fade quickly. Coming off a 1-11 debut, Brewster said it's imperative that his team "build momentum" this season before moving into TCF Bank Stadium. "We've got to put a football team on the field that can win," he said. "Heck, you put a team out there that's not going to win, it doesn't matter what stadium you're in, right?" It didn't in the final years of Memorial Stadium. The Gophers posted a 65-74-3 record and averaged 39,895 fans in their final 13 seasons in Memorial Stadium. They did not average 50,000 fans in any season during that span. "I was all in favor of going into the Dome," said former coach Joe Salem, whose tenure bridged both stadiums. "How it turned out, winning is, of course, everything to it." The stadium will be a draw in itself initially. After that though, it's all about the product. "I don't believe anybody is going to buy tickets for very long to see the facility," said former All-America Bob Stein, a stadium proponent. "You can walk through the facility and see it for nothing." Said Adzick, "Stadiums don't make first downs." Athletes do, and the stadium should help attract better recruits. Brewster's first full recruiting class was nationally ranked despite the obvious drawbacks of the Metrodome, but he said TCF Bank Stadium should eliminate those negatives. "When recruits come to games now at the Metrodome we are at a competitive disadvantage," he said. "Right now, kids can go to other places in the Big Ten and across the country and have a better gameday experience than they're going to have at Minnesota." Brewster's predecessor, Glen Mason, sang that song repeatedly throughout his 10-year tenure, which he said was more fact than excuse. "We never had a chance to show recruits where they are going to play," Mason said. "It was always set up for something else. Like a snowmobile race or Monster Truck show. It looked nothing like football." Former coach Lou Holtz made the Gophers a hot ticket in two seasons in the mid-1980s and once thought the Metrodome was a suitable home. But Holtz agrees that recruiting should be easier now that the Gophers no longer have to share their stadium. "The most important thing is that it's yours," Holtz said. "This is our locker room. We decorate it. Nobody else is in here. This is our house, our home. You can't do that when you're sharing with so many other people." Some obstacles won't go away. Such as the weather. The move outdoors will only encourage rival schools to remind recruits -- especially ones from southern states -- that it gets cold in Minnesota. Salem fought it, even pointing to a TV commercial that showed a car battery cranking up in arctic Minnesota temperatures. "That ad just killed me," Salem said, laughing. "It went all over the country." The Big Ten season traditionally has ended before Thanksgiving, thus reducing the chance for inclement weather. But perception is often reality, which is why Brewster has moved to spread a different message to recruits. Brewster calls the weather factor "an absolute fallacy" and said his staff conducted a study that found the average gameday temperature for Gophers home games the past 20 years was 64 degrees. "I think the weather issue is way overblown," Brewster said. Some fans accustomed to the controlled Metrodome climate probably are not too excited about the prospect of getting rained on, or worse. But that's part of the deal, part of the experience. Longtime season ticket-holder Neal Johnson still remembers vividly the sight of a Boy Scout saluting the flag during the national anthem while getting drenched before a game at Memorial Stadium in the late 1970s. "It was just awesome," Johnson said. "It was obviously a special thing because it happened 30 years ago, and I'm still telling the story." Gophers officials hope a new stadium will lead to new memories being retold 30 years from now. Maturi often thinks about his own experiences at Memorial Stadium as he passes the new stadium during his 6 a.m. jog every day. As a symbolic gesture, Maturi began gamedays the past two years by running from his Minneapolis home to the Metrodome and finally down to the site of TCF Bank Stadium. "I have one more year to do that," Maturi said. "I'll run around the stadium," he said. He leaned back in his chair and smiled at the thought. 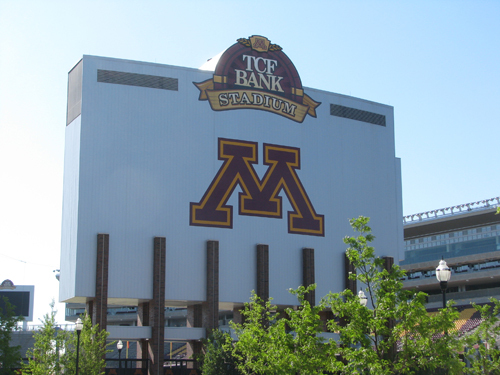 Minneapolis, Minn. - University of Minnesota Athletics announced that loge boxes are completely sold out for the 2009 football season and that the remaining premium seating at TCF Bank Stadium continues to sell at a brisk pace. According to David Crum, associate athletics director for development, the last of TCF Bank Stadium's 54 loge boxes was purchased and that the remaining inventory consists of private suites, outdoor club seats and indoor club seats. "People in Minnesota are genuinely excited about both Gopher football and TCF Bank Stadium. I believe that fact it's clearly reflected in our premium sales numbers," said Crum, whose Golden Gopher Fund staff is managing all premium seat sales at TCF Bank Stadium. "In addition, general season ticket sales have already been cut off for next season due to demand. And though we have created a waiting list for tickets, the only current way to guarantee yourself a seat in TCF Bank Stadium for next year is to purchase a premium seat." Crum said he was also pleased with the sales numbers the Golden Gopher Fund is reporting from TCF Bank Stadium's private suite inventory as less than 10 remain. TCF Bank Stadium's private suites seat between 16 and 19 fans and come fully equipped with luxury amenities. Minneapolis, Minn. - Alumnus Denny Sanford has pledged $6 million toward the University of Minnesota's new TCF Stadium that opens this fall. Sanford had earlier pledged $35 million toward the venue if it could be named after him, along with other conditions, but the two sides could not work out an agreement. Sanford, who lives in Arizona, recently decided to contribute to the project. The university has already received a $1.5 million contribution from him, and the rest will be provided in $500,000 yearly installments over nine years. Minneapolis, Minn. - University of Minnesota President Robert Bruininks has recommended that alcohol be banned for the school's new TCF Bank Stadium that opens this fall. The ban will apply to all of the school's sports facilities. Alcohol was to be allowed only in premium seating, but the Minnesota legislature passed a bill that required that all fans have equal access to alcohol. Rather than extended access, Bruininks is recommending that all sales be banned. No Big Ten school serves alcohol in its general seating and the school was not about to become the first, Bruininks said. While fans could buy beer in the Metrodome, the team's former home, with football returning to campus, he said the rules have changed. Backing off alcohol will have a financial impact, according to a university news release. Bruininks said selling alcohol in premium seating could have "insured more robust revenues ... and better protected our ability to retire the debt" on the building. The Board of Regents will review Bruinink's recommendation and could take action at its June 24 meeting. Minneapolis, Minn. - Those wanting to buy a $140 parking pass at the new University of Minnesota TCF Bank Stadium for tailgating will also have to make a $1,000 donation to the school's athletic fund. Season-long parking passes for TCF Bank Stadium are available to all 2009 season ticket holders. With many lots already sold out, the closest fans can purchase the $1,140 pass is Lot 37, which is located behind Ridder Arena. Ticket holders who choose not to purchase season parking passes for Lot 37 can purchase a season parking pass at the Oak Street Ramp for $105, or at the State Fairgrounds in St. Paul for $70. The State Fairgrounds lot will also be available for single game parking at $10 per vehicle. Lots have been organized into four different zones based on their proximity to the stadium. Parking passes for lots in zone one, those closest to the stadium, have already sold out and required a minimum $2,500 donation. Minneapolis, Minn. - A slow economy and a ban on alcoholic beverages have hurt premium seat sales for the University of Minnesota's new TCF Bank Stadium meaning the school may get $2 million a year less its first year than originally anticipated. Along with the desirable but less-pricey "preferred" seats, they are supposed to generate 40 percent of overall revenue at the new facility. Even with the losses, the Gophers' on-campus stadium is still expected to generate more net revenue than their former home, the Metrodome, and the revenue hit is not expected to interfere with the U's ability to pay off construction debt. Lagging suite sales are a problem, and not just in Minnesota. Universities across the country are having a hard time renewing existing stadium suite contracts in this economy, never mind starting from scratch with a new facility, said Matthew Brown, associate professor of sports and entertainment management at the University of South Carolina. The renovated Boone Pickens Stadium at Oklahoma State University, slated to open Sept. 5, has 101 of 135 suites filled, said Kevin Klintworth, athletics director of media relations. The Minnesota Twins seem to be doing a bit better. The team has sold 47 of the 54 suites at Target Field, and the team expects the rest will sell by the time the downtown Minneapolis ballpark opens next year, said Kevin Smith, public affairs director for the baseball team. One problem for UM was the legislature's decision to ban all alcohol sales in the stadium. The goal had been to sell alcohol just in the premium seats, but legislators were told that state law required all or nothing. They opted for nothing. The result was that 15 premium seat contracts were cancelled, including two luxury suites. Most buyers said the alcohol ban was to blame. The ban was announced after many fans had already purchased seats. In compensation, customers were offered 10 percent refunds. The givebacks, plus potential additional cancellations related to the alcohol decision, could create an additional $1 million in lost revenue for the department this year. Customers don't have to take their 10 percent discounts this year. They can defer it to next year and make it 20 percent, or take it in food and drink vouchers worth $50 per seat per game. Most so far are electing to put the discount off till next year, officials said, which could mean less of a short-term hit. 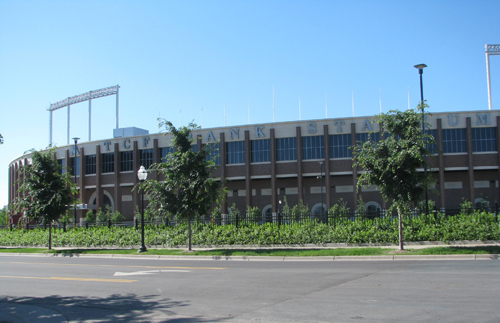 St. Paul, Minn. - The Minnesota legislature is considering a bill that would allow the University of Minnesota to sell alcohol in selected areas of TCF Bank Stadium. The measure, sponsored by Sen. Sandy Pappas, would repeal a law passed last year that required liquor to be served throughout the stadium or not at all. That prompted the university's Board of Regents, which didn't want to make liquor available everywhere in the new on-campus stadium, to ban it altogether. Unhappy university supporters are hoping the Legislature provides some flexibility - presumably so the board at least could allow liquor to be sold in premium seating areas. The Senate Higher Education Budget Division approved Pappas' proposal on a unanimous voice vote and sent it to the full Finance Committee. But Pappas said she will offer an amendment with the language to a major higher-education bill, which is on the Senate floor and awaiting action. If her amendment stays in the bigger bill, that would keep the issue in play in a Senate-House conference committee even without action in the House. The Senate bill, which also applies to Williams and Mariucci arenas, includes a provision that requires all profits generated from the sale of liquor at the stadium to be used for athletic scholarships at the university. Minneapolis, Minn. - The Minnesota Legislature opted not to pass a bill that would have allowed alcohol sales at the University of Minnesota's TCF Bank Stadium. The school originally hoped to sell alcohol in premium seats only, but state law said that sales must take place in the entire stadium or not at all. School officials then decided not to sell alcohol at all. The change this year would have allowed sales in premium seats only, but the legislature decided not to approve the measure. The Minnesota legislature has approved a bill that would allow alcohol sales in one-third of TCF Bank Stadium on the University of Minnesota campus. The school must now decide if it wants to take advantage of the legislation. Originally the school only wanted to sell alcohol in premium seats, but state law required that alcohol be available everywhere or nowhere. The school opted not to sell alcohol. Minneapolis, Minn. - Despite a new law intended to ease restrictions on the sale of alcohol at home football games, the University of Minnesota will keep the stadium dry, officials said. "We appreciate that a number of legislators worked to find a middle ground on this issue," President Robert Bruininks said in a statement. "But the university did not seek out this legislative change and has been very clear that it was never our intent to provide alcohol in the general seating areas of our athletic venues." The change in law was an attempt by legislators to let the U recoup some of the $1 million or more in revenue it lost after it banned alcohol prior to the stadium's opening last fall. The U had planned to sell alcohol in TCF Bank Stadium's premium-seating areas only, but lawmakers required that alcohol be sold everywhere if it were sold anywhere. Not wanting to serve liquor in general seating - where many students sit - the U made the whole stadium dry, which meant offering refunds to fans who already had bought premium seats. The alcohol ban extended to Mariucci and Williams arenas, too. As part of the plan, 75 percent of revenue from alcohol sales would go to scholarships for undergraduates from families with annual adjusted gross incomes under $100,000. School officials insisted that they did not push this year to have the subject revisited, even though they acknowledged it had led to a substantial revenue loss. Dan Wolter, a school spokesman, said the university lost as much as $1.3 million in revenue and had to discount its premium seating by 10 to 20 percent. A Minnesota Senate committee approved bills granting breweries permission to sell pints of beer on the premises, and allowing limited alcohol sales at the three-year-old TCF Bank Stadium, the Star Tribune reported. In the past two years, legislators and then-Gov. Tim Pawlenty have blocked the University of Minnesota's attempts to sell alcohol only in the stadium's premium seating areas. Some legislators had called the school's plan "elitist," and at one point had advocated that the school's board of regents make alcohol available to everyone at the stadium or no one. University officials, in response, opted to ban alcohol not only at the football stadium, but also at all other on-campus athletic facilities. With a new governor and Republican majorities in the Legislature, the Star Tribune said the proposal's chances may be dramatically altered this year. Gov. Mark Dayton has not indicated his position on the issue and the House, which opposed limited sales when it was controlled by DFLers, has not yet debated the topic. Minneapolis, Minn. - The Star Tribune notes that a year after the Minnesota Vikings were suddenly forced to play a game at the University of Minnesota, the two sides finally are settling the bill. The Vikings paid most of the $1.8 million original bill for playing at TCF Bank Stadium last Dec. 20, but school officials acknowledge they have been "flexible" with the team, knocking off about $86,000 from the original amount owed earlier this year and recently making a further reduction. The team now owes less than $50,000. Scott Ellison, an associate athletics director at the university, said the school also allowed the Vikings to leave some costs unpaid until the team settles with its own insurance company. Ellison said the taxpayer-supported university was trying to be a "good neighbor," and was told the team's final check would arrive shortly. Lester Bagley, the Vikings vice president for stadium development and public affairs, said the team had already sent in its final payment. The unpaid balance occurred, he said, because "accounting [and] financial matters needed to be resolved." He said there was no dispute between the university and the Vikings over the bill. After a snowstorm last December collapsed the Metrodome's inflatable roof, the Vikings were forced to play their last two home games elsewhere. 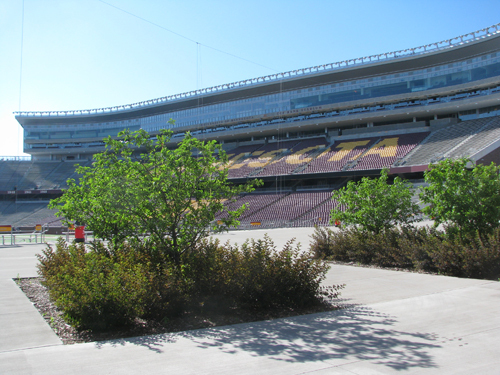 The TCF Stadium game, against the Chicago Bears, came nine days after the roof cave-in and was hurriedly arranged for the university's football stadium. "Being this was such an extraordinary event, the U wanted to help the Vikings and the [National Football League] as much as possible," Ellison told the newspaper. "There is no book or script written for what we, and for that matter the Vikings, went through so we were as flexible as we could be with the Vikings." The issue is significant because if a new stadium is built on the site of the Vikings' long-time Metrodome home - a plan favored by city of Minneapolis officials - the team would likely play more games at TCF Bank Stadium while the new stadium is being built. A confidential university memo showed that the bill was originally $1.792 million last January, but was revised to $1.706 million in March. By March the team still owed $86,053. The memo outlined the game's many unexpected costs, including $3,504.60 for police bomb dogs, $35,326 for extra snowplowing by Hennepin County and $5,225 for golf cart rentals. Temporary heating equipment for the game, which was played in frigid temperatures and on a slick field, totaled another $119,971. The university also billed the team $1,590 to rent cash registers. In an e-mail to Vikings officials earlier this month, Ellison told the team that "I have taken 15 percent off of the 'rent' we charged for Williams Arena for the warming house and the 2 club rooms used on game day." He added that "I also reduced the rent charged for the Band Spaces." Ellison told the team that its new balance was $41,990.22, down from $49,666.76. "We had a use agreement, and we had an accounting of what it cost to put that game on and, basically, how much money we lost," said Bagley. He said the Vikings lost a "significant amount of money" because the game had to be played at the smaller TCF Bank Stadium as opposed to the Metrodome. Because the roof collapse forced the team to play two games elsewhere, said Bagley, the Vikings overall "lost tens of millions of dollars." Minneapolis, Minn. - The Minnesota Vikings and the University of Minnesota have struck a tentative deal on how much the team will pay to play at TCF Stadium while a new Vikings stadium is built near the Metrodome. While declining to say how much the Vikings would pay per game, Vikings spokesman Lester Bagley told the Star Tribune that the tentative agreement would add roughly 3,000 temporary end zone seats to the university's 50,000-seat stadium. "We have close to 53,000 season-ticket owners, so we're trying to at least get to that," said Bagley, the team's vice president for stadium development and public affairs..
Other details still need to be resolved before the plan can be finalized, Bagley said. "I'd say there's an agreement in principle there, but formal signoff is yet to occur between the Vikings and the university," he said. Because it is unclear how many games or seasons the team would play at TCF, Bagley said the school and team had reached a tentative agreement on the cost per game. 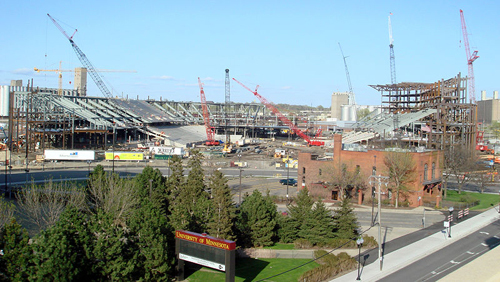 In December 2010, the team paid $1.7 million to play a game at TCF after the Metrodome roof collapsed. Also, Minneapolis officials asserted that Target Center improvements remain on the table as they work toward a public deal for a new football stadium. Officials say they hope to have a deal in place within a week. Sources told the Star Tribune last week that Target Center renovations and refinancing were being handled separately from the proposed Vikings deal. The city would, however, be allowed to use existing taxes for the aging, city-owned arena. Mayor R.T. Rybak wants to use hospitality taxes to help pay for a stadium after Convention Center bonds are retired in 2020, while redirecting some money to renovate and pay debt on Target Center. "It is still part of the deal," said Chuck Lutz, the city's development chief. "It's an integral part of the deal. ... The key reason why we're doing this deal is because of Target Center." Taken over by the city in 1995, Target Center has become a burden to city taxpayers. The city recently calculated that it will have to spend about $32 million on the arena over the next 10 years. A bill is moving through the Minnesota Legislature that would allow alcohol sales at the University of Minnesota's TCF Bank Stadium. The Minnesota Daily says the bill would allow sales in luxury suites and in a designated arena in or near the stadium. If the bill goes through, it will be up to the Board of Regents to approve alcohol sales and determine where the beer garden would go. Regents Chair Linda Cohen said she thought the amendment is a "very good idea." Last year, the University didn't sell all of its suites, she said. The University's interest isn't in selling alcohol, but selling its seats. She said she believes that corporations will be more likely to lease suites if alcohol sales are allowed. Alcohol sales in a beer garden would be more controlled than if beer were sold in the student section, she said. Supporters of the bill say the University would gain $1.5 million to $2 million a year in revenue. The Minnesota Legislature has overwhelmingly approved letting University of Minnesota football fans drink alcohol at TCF Bank Stadium. Gov. Mark Dayton said he will sign the measure. Alcohol has been banned at the new stadium since it opened because lawmakers objected to the university's plan to allow drinking only in the arena's expensive suites. The new plan allows beer for all in special tents during college football games through halftime. The Star Tribune said the plan would bring an extra $1.5 million to $2 million in revenue to the cash-strapped university and would require the beer vendors to sell at least one Minnesota brew.